Pioneers in the industry, we offer anastrozole tablets from India. 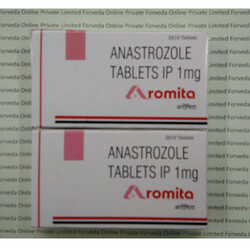 Aromita 1 mg tablets is a Brand of Anastrazole, Aromita is manufactured by Intas pharmaceuticals, Internationaly available as Arimidex by Astra Zeneca. Aromita is used succesfully for the treatment of Breast Cancer.